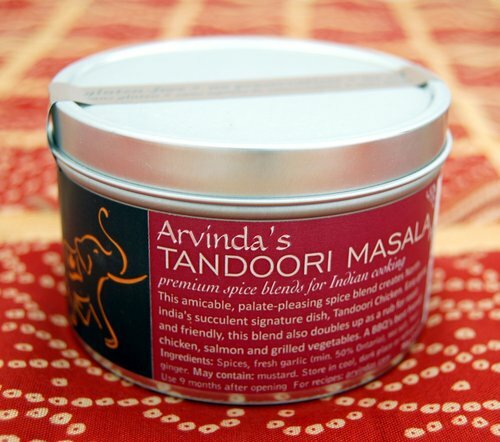 During the summer months, Arvinda's Tandoori Masala always seems to be our favourite masala. I tend to add it to everything (pototoes, tofu, grilling veggies like sweet peppers, zucchini, portobellos and more!) for easy, light and delicious lunches and dinners on the days you want something quick to enjoy on the patio--and something to use for a BBQ. Not too long ago I was in Olivo Fresco, a neighbourhood gourmet food shop that sells flavoured olive oils and balsamic vinegars in addition to other pantry staples (including a couple of Arvinda's masala varieties too). I was speaking to owner, Georgette at the store who was telling me about a recipe she made with salmon, marinated with Arvinda's Tandoori Masala and seared in Olivo Fresco's Persian Lime olive oil. It sounded like a 5-star meal and thought I should try it and share with others. 1) Marinate fish in olive oil (with lime) and ARVINDA'S TANDOORI MASALA for 10-15 minutes. 2) Place fish in a skillet, add sea salt as needed and cook on medium-high heat until cooked and golden brown in colour, approximately 4-5 minutes.